Around 10 a.m. Venice is rapidly filling with hoards of tourists To be there an hour earlier does the trick! With a private boat we transfer from the bus to the very heart of the town – to majestic St. Mark’s square. You could read all that is written about Venice and it would still be impossible to imagine this dreamlike ensemble of Basilicas and Palaces lining the waterfront. During a short walking tour your guide will point out the most important sights. There will be ample time to visit one of the renown glass furnaces… to ride a gondola (approx € 32)… for shopping… or simply a stroll where every corner reveals new highlights. In the afternoon we return to our bus and continue the journey south to Rome. Evening arrival at our hotel. You can participate in our optional tour of the Vatican Museum, the Sistine Chapel with Michelangelo’s Frescoes and St. Peter’s Basilica, (€ 69) highlighting a priceless collection of the world’s best artworks. Your Vatican Guide is a known expert of art and history and with the help of individual radio headsets will make it a memorable tour. The afternoon is reserved for the Rome of the Caesars. We continue to the Colosseum , the imperial Forum and the Capitoline hill - the very heart of the Roman Empire. There is time for an ice cream at the Trevi Fountain before we go to see the incredible Pantheon - dating back over 19 centuries, it is the largest and best preserved temple of ancient Rome. Have an Italian coffee and enjoy the atmosphere or get your portrait done. Before we return join our dinner in a typical restaurant (approx € 37). Join us for our big optional tour (extra). For the painstaking work in which scholars seek to put together the fragmented remainders of the past, the discovery of Pompeii has been the most fortunate event. The 79 AD eruption of the nearby volcano Vesuvius with its poisonous exhalations and the enormous rain of ashes brought all live to a sudden end. Excavations that continue for now 250 years brought back to light the most precious document of the ancient world. You spend the morning with a guided tour featuring the highlights of Pompeii. A true journey back in time. 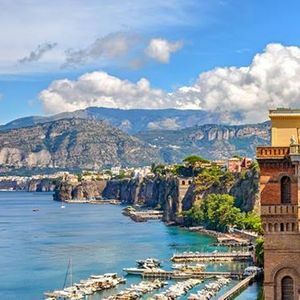 In the afternoon we take the Sorrentina, a panoramic drive disclosing spectacular views over the Golf of Naples. 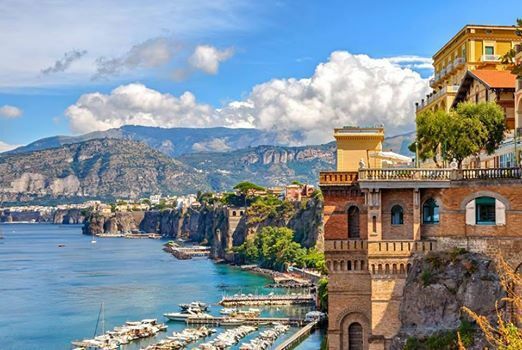 Take a stroll through the narrow and picturesque streets of Sorrento. After free time for shopping we depart for Rome. We head north to Tuscany to another highlight of our Italian Dream. After the fall of the roman empire a dark and artless age began. It was in Florence, the celebrated monument of the reawakening of mankind where the masters of the 15th Century exploded in a renewing of western society. Our walking tour will begin at the academy museum with the original statue of David. You will see the Ponte Vecchio, the Dome of St. Mary with the cupola of Brunelleschi, Giotto’s celebrated Bell Tower, the Baptistery with Ghiberti’s Masterpiece, the doors which Michelangelo called the Porta dell Paradiso. Passing by Signoria Square, the old Palace and golden St.Michael we end at the Franciscan St. Croce Church, resting place of many of the geniuses of the Renaissance age. Of course there will be free time for shopping (Florentine leather and gold). We check into our hotel in the late afternoon. Tonight you may attend a Tuscan Gala Dinner – perfect food and perfect music - a fantastic way to top your stay in Italy (approx € 45). We make a stop in Pisa. Your guide will walk with you to the illustrious field of the miracles. See the cathedral, the baptistery and the famed leaning tower. Our way home will lead through Switzerland - one more scenic highlight with the breathtaking vistas of lakes and mountains. Return to pickup points.